A pink and red Sydney Harbour Bridge and a giant pig lantern today launched the start of Sydney Lunar Festival – the largest celebration of Lunar New Year outside of Asia. Sydneysiders, tourists and workers ushered in the Year of the Pig as Lord Mayor Clover Moore launched the festival with an eye-dotting ceremony and lion dancers in celebration of Sydney’s largest ever Lunar New Year. “Sydney Lunar Festival will be bigger and brighter than ever before,” the Lord Mayor said. The City of Sydney’s spectacular launch unveiled four new Lunar Lanterns designed by talented contemporary Asian–Australian artists. 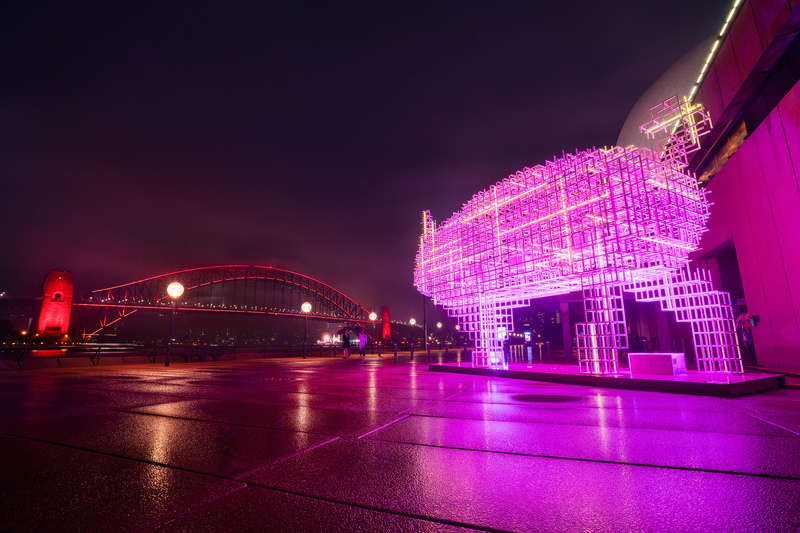 The 5-metre-tall matrix-style steel pig lantern at Sydney Opera House is designed by Justin Qian. Along the Circular Quay foreshore is an elaborate 8-metre stack of monkeys by Louise Zhang. At the Rocks, Pamela See’s three 2.8-metre ‘electric’ sheep feature in Bligh and Barney Reserve, while the square in front of Cadman’s Cottage hosts a 6-metre inflatable ox by Laurens Tan. Festival visitors can explore 13 Lunar Lanterns in total, featuring the signs of the Chinese zodiac, dotted across the Circular Quay foreshore. An additional Pig lantern, designed by John Deng, will be at the Overseas Passenger Terminal. Curated by artist and writer Valerie Khoo, Sydney Lunar Festival is expected to attract more than 1.3 million visitors from 1 to 10 February to celebrate the Year of the Pig. The Sydney Harbour Bridge will glow pink and red every night from 8.15pm. Designed by Asian-Australian artists, these zodiac lanterns stand along the foreshore of Circular Quay from the Sydney Opera House to the Overseas Passenger Terminal for 10 days and nights. On Friday 8 and Saturday 9 February, world champion lion and dragon dancers will also light up the exhibition. Meticulously decorated with hundreds of LEDs, the illuminated lions and dragon will come to life through slick and graceful movements that mimic the emotions of these mystical animals. More than 450 Chinese, Korean, Japanese, Vietnamese, Thai, Malaysian and Indonesian performers will take part in a free outdoor concert for all ages at First Fleet Park in The Rocks. This celebration of culture, community and friendship will feature traditional and contemporary performances. Lion dances with drummers take place on Friday, Saturday and Sunday evenings throughout the festival. Visitors will enjoy hundreds of red, gold and pink lanterns suspended over Dixon Street in a spectacular overhead curtain display from 1-19 February. The Lord Mayor will host a red packet handout on 5 February – Lunar New Year’s Day in Chinatown, where she will meet and greet locals and tourists. There is an extraordinary mix of restaurants, noodle bars, food halls, shops, and market bargains to be had at this time of year and Chinatown is the go-to for quality Asian cuisine. On 9 February, the Ayam Zodiac Roulette Tuk Tuk in Dixon Street Mall offers a ‘destiny dish’, which includes a personalised horoscope prediction for 2019 and an Ayam ingredient to take home to prepare your festive feast. From 1-10 February, World Square is inviting Sydney-siders to join their Lunar New Year celebrations as they host a series of cultural events, an immersive augmented reality experience, meet and greet with three little piglets and a traditional lion dance on poles from renowned lion dance troupe Jin Wu Koon Dragon & Lion Dance company. Sydney will attempt to set a new World Record for the most people eating dumplings in one location at the same time. In partnership with WSFM’s Jonesy and Amanda and Channel 7’s My Kitchen Rules, the Largest Yum Cha Meal will take place at 11am on Tuesday 5 February in Tumbalong Park, Darling Harbour. Making waves in the city, official charity partner Surf Life Saving NSW will host a pop-up beach at First Fleet Park in The Rocks. The beach will feature classic Surf Life Saving NSW red and yellow umbrellas, deck chairs and a blow-up ball pit. Visitors can check out water education for all ages, children’s entertainment and make-your-own-zinc workshops. Volunteer lifesavers will demonstrate everything there is to know about safety in the water. This two-day regatta, with 3000 paddlers competing, will start with a traditional Taoist monk ceremony to bless the waters and eye-dotting of the boats, said to awaken the dragons. More than 100,000 spectators will watch the biggest dragon boat races in the southern hemisphere, which involves corporate, charity and sports club participants. The Sydney Opera House will celebrate the Year of the Pig with an exciting program of events. Its sails will glow red on the evening of Monday 4 February and there will be sunrise tai chi, the hero pig Lunar Lantern to explore and orchestral concerts to enjoy. The Opera House will host a wide selection of Lunar New Year cuisine at its restaurants and bars along the foreshore, as well as tours in Mandarin. There will be more than 80 associated events in the Sydney Lunar Festival – ranging from The Rocks Lunar Markets, Lunar New Year at Luna Park, music at the Chinese Garden of Friendship, a Pigs in Mud exhibition at Craft NSW and a congee breakfast tour in Chinatown.